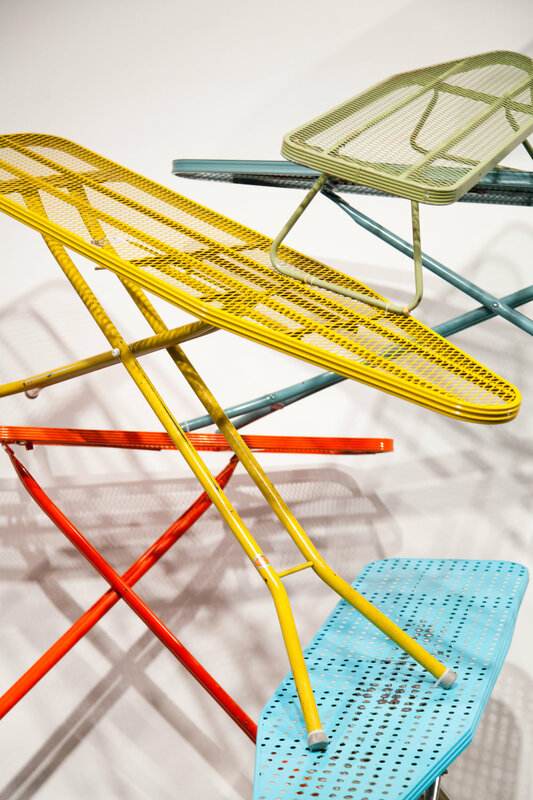 On Board is a structure created from a collection of found ironing boards that Mazi began to search and gather during two years of her undergraduate studies. The boards are all original in colour, shape and function; they were not manipulated or changed from the original way she found them. This assemblage posses an anthropomorphic playfulness, but as the structure leans towards the viewer causes a threat of dissembling. This specific arrangement of the ironing boards was shown as a part of Mazi's Honours Exhibition at Rodman Hall Arts Centre during her undergraduate studies Brock University, but the structure will continue to change as the collecting continues.